Formed in Leipzig in 2009 by Paul Schlesier, BLACK SALVATION’s early years pivoted on jamming gritty dirges, and elongated, repetition-based space-outs. Over the next few years, the Germans, with bassist Birger Schwidop and drummer Christian Seitz in tow, honed their craft and assisted in the foundation of Into Endless Chaos (IEC), a DIY organization of Leipzig-based counter-culture musicians and artists. Confident in their heavy wander and galvanized by their IEC interactions, BLACK SALVATION released their debut album, “In Deep Circles,” without label support in 2014. With Bruniusson behind the kit now, BLACK SALVATION wasted little time—a week, basically—before entering an unnamed rehearsal room (not a studio proper) to track “Uncertainty Is Bliss.” They emerged with a new album that contains eight tracks. “In a Casket’s Ride” opens the album at over seven minutes. Some dissonant keys lead into a bluesy riff where the notes are an octave apart, kind of like ZEPPELIN’s “Immigrant Song.” The guitars are somewhere between distorted and clean, and the vocals are dark and trippy. They lay on that riff throughout, introducing some vocal moans along the way, as cymbals constantly crash over top. “Floating Torpid” opens with bass guitar moves along a little quicker, reminiscent of THE DOORS for me. The vocals echo with reverb and there is a charismatic quality to the way Paul sings for sure. Confidence is what it is. “Breathing Hands” has a psychedelic and hypnotic sound. The riff is just a strum that drones over and over, coating you in a thick syrup. There are no discernable lyrics here which is part of the reason it retains that outer world sound. “Leair” is an interesting piece…spiraling a bit into the Doom genre; a combination of well know bands of the past like BLACK SABBATH and THE DOORS. Emotions come out of check a bit when Paul reaches the upper ranges of his singing. “A Direction is Futile” is a nine-minute wooly mammoth. There are extended instrumental passages of spacy proportions; almost free jamming in the guitar riffs. Vocal moans echo in and around you in a sign of dread. At the end you feel like you’ve been on a trip to the dark side of your mind and back. “Grey River” moves with a quicker pace, and a more jovial riff. The melody in the guitars is noteworthy, though it still retains a dark edge. “Getting Slowly Lost” is a melancholic affair as the album closer. Vocals and a soft guitar riff work to create a feeling of heavy despondence. If you’re a fairly newly formed hard rock band, in an era where the genre has been alive for over 50 years, how do you avoid falling into the trap of just repeating what has been already done? Personality and flavor are the only way. 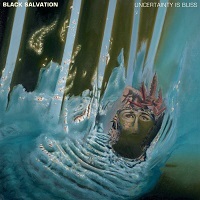 Even with a straightforward and elemental sound, BLACK SALVATION pulses with their own personality on “Uncertainty Is Bliss.” Although it’s nothing really new at all, it was an enjoyable album in the realm of psychedelic Rock, with the highlight for me being the vocals.